← How Would 2019 Be For Aries Zodiac Sign? 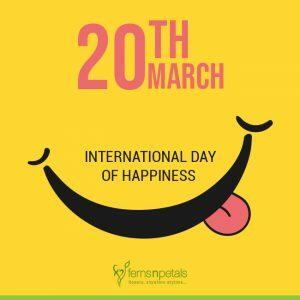 20th March – it is the International Day of Happiness. Since 2013, this special day is celebrated all over the world. This concept came from the great activist, philanthropist, statesman, and a prominent advisor of the United Nations Jayme Illienn. The objective was to inspire the global happiness movement. Whatever we do in life is strangely linked to happiness. You want a home in a posh locality, a BMW, or want to marry your soul mate – every decision you take has the undertone of happiness. These are big goals in life that take time to materialize. You may meet some challenges in attaining big goals in your life and that doesn’t mean that until and unless you achieve these big things you would remain distressed and unhappy. Always remember that there are and would always be millions of reasons to be upset and amidst all those you just need only one reason to be happy. That one single reason to be happy is something that comes in small forms. Spread your eyes all over your regular days and see how many tiny happy moments you gather. Here is a list of those little things in everyday life that brings happiness easily. Count these small things in your daily life & stay happy & spread happiness. Those who stay in a hostel and miss that simple yet special “Maa Ke Hath Ka Khana” (mom’s special food), that special Sunday or festival-specific food is really a happiness boosting factor. The taste perhaps can never match up to what your mom makes but the whole feeling of sharing a special menu with roommates will always remain in your heart. Buying a new dress or having a new dress gifted by someone is no doubt a good feeling. But wearing that new dress is always special. The touch of new fabric on your skin, the smell of the new piece of cloth, & the print on it – everything easily puts you in a happy state of mind. Biryani is a special food item invented by the Mughals. This food item is perhaps one of the most secular food in our diverse country. Every state has its signature taste of Biryani. The smell of Biryani when your mom is cooking or when you are experimenting in your kitchen or when you order that online or simply when the smell of biryani cooked at neighborhood hits your senses – it is a happy moment! When you receive a gift from your family members on any special festival for which you couldn’t be with them – fills your heart with immense joy. So, today on Happiness Day, spread such sweet & surprise gifts among your family members or best friends who are your source of joy. There is immense happiness that you derive from that first cup of morning ginger tea. Without this cup of energizing tea, the day is incomplete, unhappy, and cranky! Just witnessing the rain staying indoors, relishing on the plate of onion fritters with tea, getting drenched in the first shower of the monsoon, or closing your eyes and enjoying the music raindrops create all around – that first spell of rain is simply fascinating. When you know your journey to and from office takes 2 long hours in a metro, all you pray is a seat. But this favorite public transport is always crowded and thus being a common man your happiness knows no limits when you grab a seat successfully. They say “work hard & party hard”. Well, the parties are meant for weekends and the small moment of “Friyyyaaay fun” with your colleagues is something that sets your spirits higher for the weekend. Ordering French fries, burgers, pizzas, etc. – all these things attracts more happiness truly! Everyone is busy all through the week and thus sitting with the whole family at the lunch table is essential. To know about everyone, to cherish the family bond, & to create more happy moments – this weekend lunch is essential. Those who stay alone loves to wake up at 12 or 1 P.M. on a Sunday. And then they enjoy a scrumptious Sunday brunch by ordering food online. This luxurious happiness makes you feel like a king! Oh yes! the sight of a new handsome/beautiful Joinee on the floor is something that puts you in an amazingly happy feeling. And this happy feeling is irrespective of the state of your relationship. Going to the nearest theater with your gang of comfort friends and enjoying late night show is simply amazing. When the city is preparing to fall asleep, you are wide awake to witness stories! Weekends bring happiness to the mind for sure. And when you get an extended weekend, you feel no less than an Ambani! Doesn’t matter whether you have planned a trip or a house party or simply want “to do nothing” at home! An extended weekend is simply blissful! When you return home after your long day at work, that one smile from your baby makes you feel like the richest person in this world. Nothing can beat this feeling. Appreciation from parents, siblings, friends, boss, or colleagues for your work, attitude, gesture, or action instantly puts you in a happy state of mind. A boss appreciating your dedication or a call from parents appreciating your new decision on anything in life – makes you happier & confident both! So, see happiness is dancing all around you in many sizes, forms, designs, and flavors. All you need to do is see these little things and eventually, that will attract more happiness in your life.